Tapping the Settings icon on the Galaxy S8’s viewfinder brings up a number of choices. This list gives you control of the rear camera (the one with higher resolution), the front-facing camera, which is used for selfies or video-calls, and settings that affect both cameras. These options are shown here. Picture size: One option is to pick the highest resolution and take all your images at that setting. That would be 12 megapixels per picture. Another option is to pick the lowest resolution so you can take more pictures with a given size of storage. That would be 4.7 megapixels per picture. Probably the best option is to figure out what you plan to do with the pictures and then decide the lowest resolution that will work. If all you’re going to do is put the pictures on Facebook, all that will happen is that this website will discard most of the pixels after you spent your time and money uploading high-resolution pictures. The best advice is to experiment with different resolutions and use the ones that best meet your needs. As seen here, you can set the rear-facing and the front-facing camera at different resolutions. 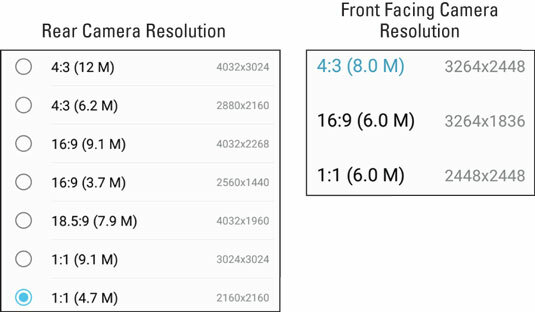 Your phone’s image resolution options for rear- and front-facing cameras. Video size: You have the option to get really carried away here. The lowest video option is VGA. This is the resolution of your old, analog television. That was perfectly adequate for us for many decades, but HD is the minimally acceptable resolution for thoroughly modern folks. However, your phone scoffs at this puny resolution, and can take it to four higher settings. The only reason to hesitate to use these higher settings is that, just as with still pictures, videos recorded in higher resolutions take more memory. It is good to know these resolutions are there. In addition to higher resolution, the FHD (60 fps) steps up quality by taking many more images per second. FHD normally uses between 24 and 30 frames per second. Using 60 frames per second removes any flicker at all. It also uses twice the amount of memory. 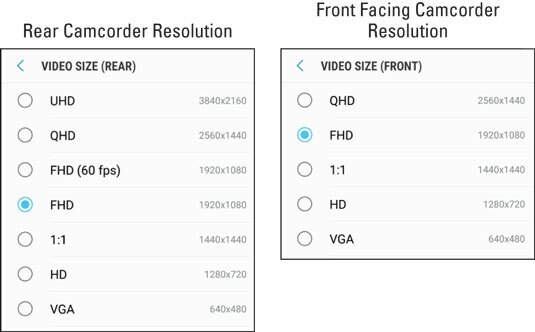 Your phone’s camcorder resolution options for rear and front-facing cameras. Tracking AF: The Samsung Galaxy S8 can spot a person’s face and assumes that you want it to be the place where you focus if you toggle this option to the On position. Otherwise, if you don’t use this mode, the camera may assume that you want whatever is in the center of the viewfinder to be in focus. Shape correction: This sophisticated tool automatically takes care of any distortions in objects that you sometimes see in pictures. Timer: The front-facing camera is meant for selfies, but sometimes you want to use the higher-resolution, rear-facing camera. You can use the timer to set up a delay of a few seconds between the time you tap the shutter release and the time the camera takes the shot. Motion photo: This is a neat capability. Selecting this option records a short video clip before you take the still photo. Video stabilization: If too much caffeine is causing your shots to blur, this capability is your answer. Grid lines: Some people like to have a 3 x 3 grid on the viewfinder to help frame the shot. If you are one of these people, toggle on this option. Location tags: The Samsung Galaxy S8 uses its GPS to tell the location of where you took the shot. If this is too intrusive, you can leave out this information on the image description. Review pictures: Some people want to see the shot right away. Others want to take a bunch of pictures and look at them at their leisure. If you want to see the image right away to see whether you need to take a second picture, turn on this toggle. It will jump you in to the Gallery app right away. Quick launch: You can launch the camera by pressing the Home button twice. If you would rather not, here is where you can disable that setting. Voice control: This option lets you turn voice control on. Your camera is listening to you. If you say, “Smile,” “Cheese,” “Capture,” or “Shoot,” the camera will snap a shot. This is simpler than using the self-timer. If you say, “Record video,” the video recorder will start recording. In either case, you can tell it to zoom by saying “zoom” — or not if you turn off this option. Floating Camera button: This is not the option to support putting your phone on a drone. This allows you to relocate on the viewfinder screen the location of the shutter button. Sorry. Volume keys function: This setting allows, or disables, the increase/decrease volume buttons on the side of the phone to control the shutter, the video recorder, or the zoom/pan capability when in camera or video mode. Shutter sound: It can be satisfying to hear the click when you take a picture. If you would rather not, turn that sound off here. Reset settings: If you mess something up, tap Reset settings, and it will take you back to the default settings.